Sheila Wallace, a beloved member of the Fellowship of Friends, completed her task from congestive heart failure, at home on Tuesday, January 20, 2015, at 6:04 pm. Sheila turned eighty-eight years last August. 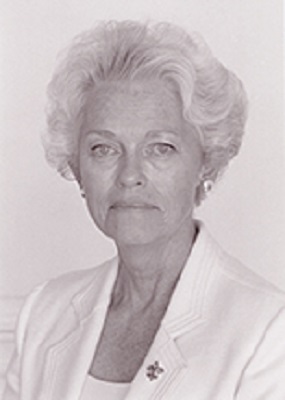 Sheila was among the first students to join in Carmel in December of 1971. She had lived at Apollo since 1973. She will be remembered for setting the highest standard for beauty and refinement in our School. Sheila developed our understanding and strength to support fine alchemy, refined ways to live, in terms of process (which is not minor). As an example, she taught people, working in a hectic little kitchen, during remodeling of the facilities, how to protect and clean museum-quality Meissen porcelain and air-twist crystal glasses. She showed many of us the methods of accomplished chefs: how to prepare Beef Wellington; why you must (cook flour in the butter) to prepare a proper French sauce; what a plate looks like, when it greets the diner with a beautiful color composition. She kept her patience, with all manner of people in the activities, rude youngsters, idealists of many stripes, and she taught those of us who remained that the beauty in the moment can provide us a compass – a way out, from mechanical erosion, within and without. Your great heart was felt by all those who came to pay tribute to your Mother and honor your friendship. What a privilege it was to be able to celebrate Sheila’s life and say a final goodbye. We are grateful that in the end that you opened up this very memorable gathering to those who felt a need to be together in remembrance. Your Mother was an extraordinary woman, as was recounted over and over again in so many varied and touching stories. It is apparent that we come into this world with gifts and they may not be suitable for all of our endeavors in life, but exceptional in others. I think of Sheila and her incredible love of beauty, design and color. I will never forget the moments we spent together deciding on colors for our house in Marin County, I still remember the color was “Biscuit,” various shades of peach, as Sheila rescued us from a horrid and sterile white I had painted the walls and cabinets to try to brighten the rooms and disguise the avocado green Formica counter tops (which never bothered her). She insisted on a beautiful peachy slipcover for the sofa and I questioned it having a two-year-old and a baby on the way but Sheila was quietly emphatic and said, “Children can be taught to sit properly on furniture.” I never forgot that, and I tried to raise our children with that mantra in mind. We still have the peachy slipcover and put it on when Meryl visited and it was as beautiful as the day I brought it home. The sofa is now replaced but the carpet, the slipcover and the kilim cushions we still have. 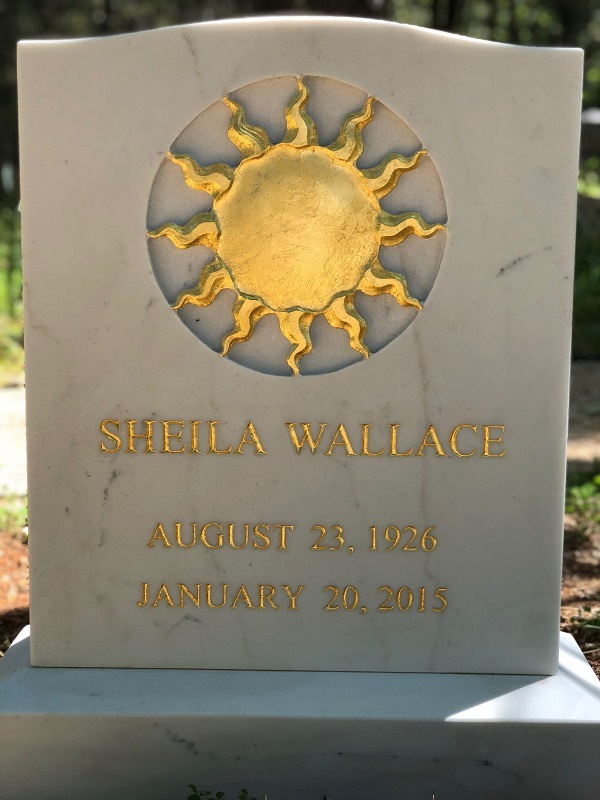 It is poignant to know how deeply Sheila affected the lives of so many of us in different ways. I was always inspired to see her sitting at Apollo d’Oro in her gorgeous pastel colors, so dignified and regal. What a beautiful toast Michael gave! From the beginning of the day seeing you at breakfast in your Mother’s pink cashmere sweater and Pucci scarf to the joyful gathering at the Mueller’s, it was so very touching and loving, a celebration of your Mother’s life. It was our great privilege to be included. We love you, Sheila. She helped form so much of what we love about you! Beauty is truth, truth beauty. That is all ye know on earth , and all ye need to know. Memories of the times Sheila and I spent sitting in her caravan and talking together are among my most precious recollections of living at Apollo. It was a wonderful gift to be in her presence. She was a true friend. I think of her, and honor her memory, often, and always will. In 1981 I was on salary at Apollo (then, called Renaissance). The American Ballet Theatre was presenting Swan Lake in San Francisco. The leading dancers were Natalia Makarova and Michael Baryshnikov. Robert encouraged all students to see the performance. 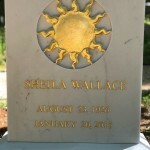 Sheila Wallace contacted me and asked me if I was going, and if she could join me.
. . . It was late when we left San Francisco, it was after midnight when we returned to Oregon House. Sheila did not talk on the way back. What I sensed, and felt was her quiet presence. This motivated me to stay alert, not go into imagination, and to get her, and myself, safely back home. I will cherish these moments of silence and presence the most when I remember Sheila. The iris still blooms, and will continue to bloom in my heart. it was the same for you. Sheila who was born the same year as my mother, has been part of the fabric of my journey here at Apollo for the past 30 years. She helped my husband Ethan buy furniture and decorate his first professional office in Sacramento 30 years ago, which helped him launch a successful business. Later we became involved in purchasing a project that Sheila had started with Aaron Greene, an associate of Frank Lloyd Wright. This building helped to set a standard for housing here in the Apollo community. Thoughts which come to describe Sheila’s gifts –gracious, frank and straightforward, lover of fine fabrics and materials, an eye for color and beautiful, modern, yet timeless design inspired by nature and the shells of the sea. Sheila’s influence and education about creating beauty in our daily lives is enduring. Many years past, during my first salaried position as maintenance person for what was called, “The Court of the Caravans”, Sheila was one of the residents inhabiting this little oasis within the budding Apollo. I cannot remember Robert’s exact words, or what may have prompted his remark, but the gist of his comment was that it was important for me to treat Sheila as a fine piece of crystal. And of course, she was. Both externally and internally. This anecdote is offered as a loving glimpse of one of Sheila’s many sides. Sheila once said she had learned to never get into a car with our Teacher unless she had her suitcase with her. She had been caught out too many times, she said, getting in for an innocent little ride down the hill from the Lodge and, well, one thing leading to another, before she knew it they would be on a plane going somewhere without even a toothbrush. It was on one such trip that I first met Sheila. She was travelling through London with Robert and others on a ‘gastronomic tour’ of England and France. Each lunch-time and each dinner-time they would go to at least two restaurants and she and Daniel got to sample all the specialties. By Bruges she had had enough of samples, rich and high-falutin’ as they were, and she proposed a plan. We would all meet in the hotel lobby at break of day and sneak out before Robert was up. We would have time to walk down to the open market where they would be roasting chicken on the spit. There we could eat a plain and simple, adorned chicken-leg, with our fingers, and hopefully get thoroughly messy. It was a great plan. The most memorable part came early in the morning, when we got down and found the door of the hotel locked. With no one at the front desk, we had to break out through a window. I don’t remember if we found the rotisserie. It may have been too early even for the locals, but I do remember Sheila’s charming audacity in hatching this and other plots, and will always remember with deep affection. Hola, querida Sheila. Te escribo en “argentino”. Te recuerdo desde hace muchos anos. Tu elegancia en todo sentido. Gracias por tu legado a la Escuela y a Robert. Farewell Sheila! Thank you for your contribution to our dear school.